After 12months - Dr ruby is very Excellent Doctor! 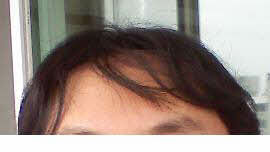 Attached are my hair pictures which are taken about 12months past after surgery. Thank you, Dr ruby . You are very good Doctor!!! I Am very very Happy! Didn’t you post before saying that you were not happy because the growth was uneven or something like that? All of a sudden everything is excellent? Is thia photo an after photo? The hairline looks very artificial. The rest look quite good. That is the before picture. Carmela’s case was a very interesting one. The absolutely straight hairline that you see in the before picture was the result of a browlift. The challange in the case was to create a frontal hairline that will blend the differing hair angulation on both the sides. Carmela was, at 5 months after HT, anxious due to uneven growth on the sides. Its usual to have the transplanted hair growing gradually. The anxiety on part of some patients is usual too. At 5 months we expect 40 to 50% growth. Its normal to see the final result at the 12 month mark. I am glad Carmela is happy with the hair transplant he got and that he shared the happy outcome with forum readers. I wish he will post more high resolution pictures of his final result. » Is thia photo an after photo? » The hairline looks very artificial. » The rest look quite good.